MAM oral care products have been developed with pediatric dentists to ensure babies develop effective and lasting oral hygiene habits from the beginning. The MAM First Brush has a compact handle perfectly sized for baby's hands so they can learn to brush independently. 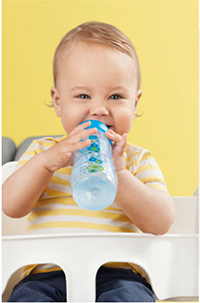 The soft rounded bristles remove plaque and bacteria and the head adapts perfectly to baby's mouth. The bottom of the handle massages sensitive gums and cleans baby's gums. Soft, rounded bristles easily remove plaque and bacteria. The red bristles indicates the recommended amount of toothpaste. Clean toothbrush regularly and between each use with warm water. Inspect toothbrush before and after each use and discard if worn or damaged. Do not boil, steam or microwave sterilize. Do not put in the dishwasher. Replace toothbrush regularly (after 1–2 months use). MAM First Brush is rated 5.0 out of 5 by 2. Rated 5 out of 5 by Sharon B from Perfect brush! Bought this for my 1-3 year olds. Great brush, great design, and perfect for my sons! Rated 5 out of 5 by Rjmom from Love it I love the mam brushes they are the perfect size and are soft on babies gum and teeth!